As we all know, on Tuesday President Obama signed into law the $787 billion American Recovery and Reinvestment Act, which was designed to stimulate the national economy and create jobs. Yes, the M-word. The 2008 season has ended, Halloween, Thanksgiving, Christmas, New Year's Day, MLK Day, Chinese New Year, Valentine's Day and even Presidents' Day have all come and gone...and still yet the Dodgers have not signed Manny Ramirez. Apparently offers have been made, then turned down, then made again, then turned down again. And while other teams are rarin' to go, the Dodgers still lack some key pieces to their 2009 puzzle. Yes, the Dodgers have been burned with big multi-year deals, but look, think of this as economic stimulus. Seriously. You get Manny on the team, people buy tickets. People buy the Manny shirts. People buy the cheesy Manny dreadlock wigs. And most of all, people buy parking at the stadium (Well, okay, maybe not the Militant, lol). It's been estimated that in the not-even half-of-a-season that Ramirez played in Blue last year, his presence in the squad raked in $24 million in merchandise alone. That's half a season, folks. This man pays for himself! Seriously, Los Angeles is not immune from the economic slump as we all know. But Manny Ramirez creates an entire economy all be himself. Call it Mannynomics. Manny Being Money. Whatever. Think of all those ticket sales. Think of all those season ticket sales. Think of all the people they'll be hiring at sports bars when folks crowd in there this October to watch Manny in the '09 playoffs. Think of all the families being fed after making Manny wigs all day (okay, granted, it's probably children in China making that stuff, but still...). Sixy, eighty, a hundred million, whatever....it's still chump change compared to a $787 billion stimulus package...yet the Dodger organization can provide economic stimulus to all of Los Angeles. Please...for the economy's sake...sign Manny now. Commandeered by Militant Angeleno @ 3:01 PM No comments: Hyperlinks, yo! 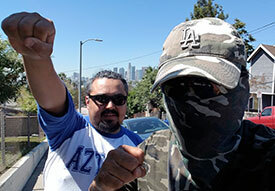 The Militant may or may not have found himself walking in the rain somewhere in the Valley, in a somewhat familiar strip of Sepulveda Blvd. in North Hills. Shielded from the elements by his um-ba-rella (ella...ella...ella...eh...eh...eh...) he walked northbound along Sepulveda, walking ever...uh. Walking continuously...uh. Um. 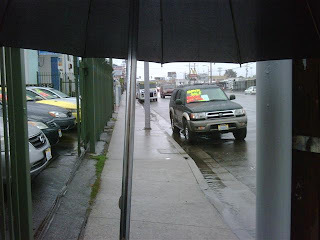 Turns out the sidewalk was so narrow at some points that the Militant was literally blocked, and had to tip his umbrella at an angle just to pass, thereby allowing several drops of rain to dilute his camouflage garb, thus defeating the purpose of carrying any instrument designed to protect oneself from the effects of precipitation. Could you imagine of the Militant experienced any cross-traffic with another umbrella'd pedestrian walking the other direction? Who would have the right of way? Would he and the other pedestrian be stalled there waiting for the other to pass? Oh the horror! But of course, this being the Valley, pedestrians were a woefully rare sight anyway, regardless of weather conditions. So this got the Militant thinking, in terms of urban design standards -- Sidewalks should be wide enough for a person carrying a large umbrella to pass through unencumbered. A reasonable request, no? Of course, so far, this has been a Valley problem, and the Miltant's short-term solution was to get out of there. Commandeered by Militant Angeleno @ 10:59 PM 2 comments: Hyperlinks, yo! Is This Any Way To Go? The Militant usually doesn't talk about high-speed (or even the lower velocity ones, as what happened) car chases that give law-breaking, pedal-flooring attention whores a great deal of their 15 minutes of fame. But on Monday night, as a Bentley covered much of a Thomas Guide's worth of roadage, 27 year old Pakistani immigrant Mustafa Mustafa, after doing his best Chris Brown impression (and we're not talking about singing here...) and leading Jon and Ponch on a 5-hour chase, ended his life with a self-inflicted gunshot wound on Lankershim Boulevard, just yards north of the Los Angeles River. Apparently, he lamented the loss of his business. This is not the first time someone decided to react radically to their financial situation. Just days ago, a Wilmington man offed his entire family and himself after losing his job at a Kaiser Permanente Medical Center. As the economic situation grows more weary, expect more of these headlines. The Militant, though, can't help but shake his head in disbelief. Is that the last thing you want to do on this Earth? Drive your car around for five hours? Why not live it up a bit? Rent a limo, no a helicopter. Buy some expensive booze. Pick up some high-priced call girls. After all, you won't have to worry about debt for that much longer. The Militant kids here...No really folks, it's just money. WTF people! The Militant has fallen on financial hard times before...and some of that was the greatest moments of his life. If a squatter in Calcutta can get by for years, how then can't a family living in the convenient trappings of America? You got hot running water and flushing toilets. And now you wanna end your life? Really now. Life is all about ebb and flow. Just as things can turn towards the worst in a short amount of time, they can likewise get better. Ya just got to ride the wave, duuuude. Maybe it's because of his extensive Mililtant survivalist training, but The Militant doesn't really mind this recession thing, really. If anything, maybe it'll give people new perspective. There's nothing wrong with being rich, but excess is mothafuggin excess. It's nice to have a lot of money, but once you become so rich that you're not able to control it yourself, and require hiring others to handle it for you...then it's not so fun anymore. The Militant also has no outstanding debt (outside of a car payment, which is more paid off than not), so even if this financial situation gets worse, he just might become rich by default. Maybe the Militant will start a new career as a financial advisor...okay maybe not. But the moral to this story is perspective. No matter what your situation is, there's always someone out there who's better off than you...and tons more people who's much, much worse off than you. Hang in there, folks. Commandeered by Militant Angeleno @ 11:18 PM No comments: Hyperlinks, yo! Let's All Go To Grammy's House! You may or may not be watching the 51st Grammy Awards show tonight, broadcast in wonderful 3-hour tape delay from the Staples Center in Downtown Los Angeles, but since we're talking about those awards with the little old school music playback device on it, the Militant might wanna take you to the new home of the Grammys -- LA Live. As the Militant mentioned back in November, the Grammy Museum opened up in early December. The Militant got to check it out last week, accompanied by Militant Operative Stingray, himself a musician, and another trusted operative who is a part-time DJ. The museum, as was described, focuses on the recording process and highlights the history of the music awards. The museum space is actually rather small, encompassing four levels of LA Live, but in actuality two complete floors, half of one and a tiny portion of another. Your self-guided journey begins with a ticket purchase from the street level box office on Figueroa, where you're led up to the 4th floor via elevator and enter the main exhibit room after walking down a visual-filled corridor made up of images from recent Grammy awards (You're not allowed to bring cameras or take pictures, BTW, but of course, as you can see, the Militant is not exactly known to follow the rules...). The first feature you'll likely see is the music genres exhibit, a long interactive table made up of computer-projected images of music genre names. By touching on the projected images on the table, you are able to see a short description and history of music genres - from ska to rapcore to drum n bass to heavy metal to new jack swing to doo wop - accompanied by a few musical examples. The descriptions are more or less accurate, though the description of "electronica" wasn't consistent with the Militant's understanding of the genre, and the musical selections for "heavy metal" were rather unexpected examples. Still, the Militant and his musically-inclined operatives spent more than an hour perusing all the genres (the Militant did notice some bugs in the touch-table interface though; touching "dancehall" pulled up the "bossa nova" genre instead...go figure...). Not to far away was a touch-screen display of "Music Epicenters" across the United States, depicting a map with not just the expected music capitals like Los Angeles, New York, Nashville, New Orleans, Chicago and Austin, but many points in between as well. Of course the Militant headed towards the Los Angeles description, narrated by Los Angeles native musician Dave Alvin from The Blasters), which went from the beginnings of the local record industry and the opening of the Hollywood Bowl in the 1920s to the heavy metal and gangsta rap scenes in the '80s and '90s. There are other similar interactive displays (usually with the aid of headphones) that show how music genres and trends affected contemporary culture - from Woodstock to disco to hip-hop. The rest of the 4th floor contains a (surprise!) interactive display which has every single Grammy award archived (one of the Militant's operatives complained about the user-unfriendly navigation of that one), and various Hard Rock Cafe-type static displays of musical instruments, mementos and wardrobe from music legends through the years. Going down to the 3rd floor (your self-guided Grammy journey takes you down each level), you're greeted to a mini-theatre environment depicting mini-documentaries of how various pop songs are written and recorded, in this case, Carrie Underwood's "Jesus Take The Wheel." The rest of the 3rd floor is really fun - there are super-interactive "studio" booths that let you record, sing, rap, mix, remix or master music. No, you can't take your recordings home, but it's still fun nonetheless. Another theatre setting shows highlights from past Grammy performances. Because they can do that. There's also a static display of Grammy awards from the past, which the Militant gives massive props for not only mentioning the 1990 Milli Vanilli debacle, but showing a picture of the infamous 1998 Bob Dylan "Soy Bomb" performance. YES! But disregarding that, it's still a pretty kickin' place, especially if you love music. The Militant and his operatives planned on spending two hours there -- they ended up spending nearly five. Yeah. Adult tickets cost $14.95, but if you're really into music, it's well worth it. Best yet, it's nice to see a one-of-a-kind museum like this here in Los Angeles, and in Downtown no less (the entire LA Live grounds have a Walk-Of-Fame-like "Grammy Walk" emblem in the ground commemorating each award year) - especially considering the awards have also taken place in New York City and in Nashville, and the actual National Academy of Recording Arts and Sciences is headquartered in Santa Monica. Commandeered by Militant Angeleno @ 12:34 PM 1 comment: Hyperlinks, yo!